Alvin Ailey American Dance Theater is a renowned modern dance company. The company have made performances that forever changed the recognition of American dance. The company evolved in March 1958, performing in New York along with Alvin Ailey and a group of young black modern dancers. After the high success of the performance, the company went on to develop the most talented and versatile dancers in the world. The company has a rich history which shows huge achievement, recognition and inspiration. The company were selected to be a part of President John F . Kennedy's presentation in 1962. They have toured internationally, as well as attracting great audiences through television and theater. Ailey wanted to give opportunities to black dancers and was proud that his company was multi-racial. The dancers in the company are always extremely versatile and you can see the energy and spirit bursting from the stage. They come from a background of training, from ballet to modern, jazz and hip-hop. The company gives a unique style of the African-American cultural experience and continues the American modern dance tradition. They have an impressive repertoire that includes more than 200 works by over seventy choreographers. 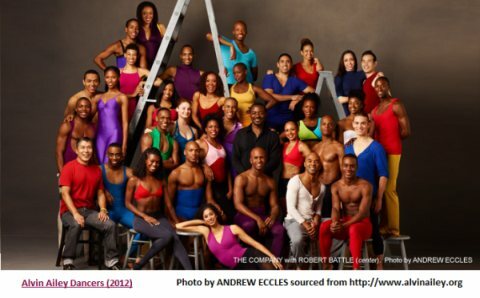 Some of the company's most well known pieces were created by Ailey himself, such as Revelations, Cry and Night Creature. The company is based at 55th Street and 9th Avenue in New York City. It is the largest complex exclusively dedicated to dance in the United States. The facility includes 12 studios and a black box theater. The company tour around the world and have performed for an around 21 million people in 48 states, as well as 71 countries on six continents. A typical Ailey season includes an international tour, US tour to over 20 cities, and a five-week New York season at New York City Center. The Ailey School is the official school of Alvin Ailey, American Dance Theater. Ailey established it in 1969 and it is situated in Manhattan at the Joan Weill Center for Dance. The school still trains over 5000 students each year with many division programs. The Ailey School trains aspiring dance students as well as extension classes for the general public.